Large engines produce a lot of exhaust gas. The exhaust gas cleaning systems of a truck are thus sized accordingly. Up to six catalytic converter systems clean the exhaust gases of a large truck engine. A catalytic converter for a car and for a truck consists of three main units: a monolithic ceramic block (mono), a fibre mat wrapped around the monoblock and an outer metal pipe. The ceramic block has a honeycomb structure and the honeycombs are coated with a catalytically active precious metal. Under the microscope, this so-called wash coat can be seen to be extremely rough. As a result, the coating has a surface area of up to 100 m2/g. The catalysis of carbon monoxide, which converts hydrocarbons and nitrous oxides into carbon dioxide, water and nitrogen, takes place on this surface. The fibre mat ensures correct positioning inside the outer metal pipe and must have precisely the correct density so that the exhaust gas does not flow past the monoblock. The outer metal pipe provides the process connection to the engine and the downstream exhaust gas line of the vehicle. Major vehicle manufacturers mount these three basic elements and other components themselves, depending on the type of catalytic converter, in their vehicle plants. Monoblocks, fibre mats and pipes are supplied. There are two different processes used for mounting catalytic converters: hard stuffing and soft stuffing. With hard stuffing, a monoblock with a fibre mat is inserted under pressure into a pipe that is enlarged beforehand to the required dimension. With soft stuffing, the monoblock with a fibre mat is loosely inserted into an outer casing and then compressed (or shrunk) to the required dimension. With both processes, the mounting of catalytic converters in an automated manufacturing cell is highly complex. As a result, many well-known vehicle manufacturers now turn to Kirschenhofer Maschinen in southern Germany. The special machine manufacturer specialises in these kinds of mounting machines and has acquired a considerable amount of know-how. With 25 employees, the company produces machines that are technological leaders in their sector. One major truck manufacturer produces up to 60 different types of catalytic converter in its mounting plant. These catalytic converters vary in size, with round, oval or polygon cross-sections, and are also manufactured using the hard stuffing or soft stuffing process. The plant has to offer a high degree of flexibility in order to handle all the variants without any refit times. The batch of pipes, fibre mats and monoblocks that were fitted in each catalytic converter must also still be traceable after 10 years in case of recalls. Production faults are prevented and detected by the machine during the manufacturing process. The monoblocks, for example, are checked for cracks and damage at the edges and any faulty parts are removed. With the hard stuffing process, the pipes have to be expanded to the required dimensions and, depending on the geometry of the subsequent catalytic converter, the different tools required are clamped into a machine and mostly changed after a production batch. This takes place several times a day, with batches of between 200 and 1000 catalytic converters and a production rate of around one catalytic converter per minute. “The customer has 20 different tools in use. The ID number of the particular tool is stored on the RFID tag. 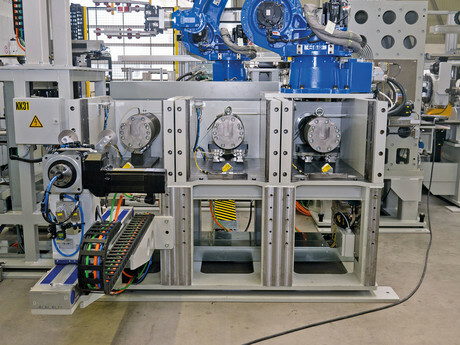 The machine uses the ID number to check whether the correct tool was inserted and only then enables the stretching of the pipe,” explained Thomas Schön, programmer at Kirschenhofer. With a force of between 30 to 60 tons exerted by the machine, the use of the wrong tool would cause enormous damage and major production failure. The tool identification process was implemented with Turck’s RFID BL ident system. The tools are fitted with TW-R30-M-K2 tags for this, which are embedded in the metal. Turck’s compact TN-Q14 HF read/write heads are fitted at the tool holders. “We chose Turck’s RFID readers due to their compact design,” said Craig Craill, head of the electrical department at Kirschenhofer. The Q14 is only 14 mm high and offers a maximum read/write distance of up to 72 mm. Although the range is shorter in the metal environment, it is still enough to protect the read/write head from colliding with the tool. Another machine type from Kirschenhofer, of which more than 10 are already in use by a major German car manufacturer, also checks the pipe diameter after the stretching process and compares the value with the tolerance values stored on the tag. The benefit of this additional option is that the machine can detect during stretching any wear on the tool, material faults or operating errors. The maximum and minimum diameters of the pipe are also stored on the tag in the current plant for truck catalytic converters. If this function is required, it can thus be retrofitted easily. The empty and full pipes are transported between the two processing stations in the plant by means of robot grippers. The pneumatic gripper has to apply a different pressure depending on whether the pipe is empty or full. The robot arm with a pneumatic gripper must only use 2.5 bar to grip an empty pipe in order not to squash it. The robot brings the pipe to the insert station, where it is filled with a monoblock with a fibre mat. It then weighs around 20 kg and has to be gripped at 6 bar, so that it does not fall out of the gripper. The relevant analog values are transferred to the pneumatic valve using Turck’s TBEN-S2-4AO Profinet I/O block. The IP67 module is fitted directly on the robot arm and passes on the values from the controller to the valve. A TBEN-S2-4AI module with analog inputs returns the analog values of the pneumatic valve to the controller. Another robot gripper just has to transport the stuffed pipes and therefore also manages with I/O modules with digital inputs/outputs. For this, Kirschenhofer uses the universal TBEN-S1-8DXP, with eight channels that can be used as inputs or outputs. “The problem with other I/O modules in this design is the fact that they don’t have their own IP address but have to be accessed via an internal bus. I can also expand the Turck system as required without any major effort,” said Craill, describing the differences between TBEN-S and alternative products.